The Pleiades is one of the most recognizable groups of stars in the northern sky. While to the naked eye this feature appears as seven bright stars, the Pleiades is actually a young open cluster about 100 million years old, containing 100 or more member stars. Though this cluster is less than 500 light-years from Earth, there is still much astronomers don’t know about it, in large part because its stars are too bright to observe with world-class telescopes. But now, a team of international astronomers has found a way around the problem, using the Kepler Space Telescope to discover and study variability in the Pleiades’ brightest stars. The work was led by Tim White of the Stellar Astrophysics Centre at Aarhus University in Denmark, and published August 11 in Monthly Notices of the Royal Astronomical Society. In their paper, they outline a new technique, called “halo photometry,” which is able to spot relative brightness changes in stars, even if they’re too bright to study directly. The algorithm looks at pixels on the camera detector next to, rather than those that fall directly on, the brightest part of stars. The algorithm measures changes in the values of those pixels to identify variability. 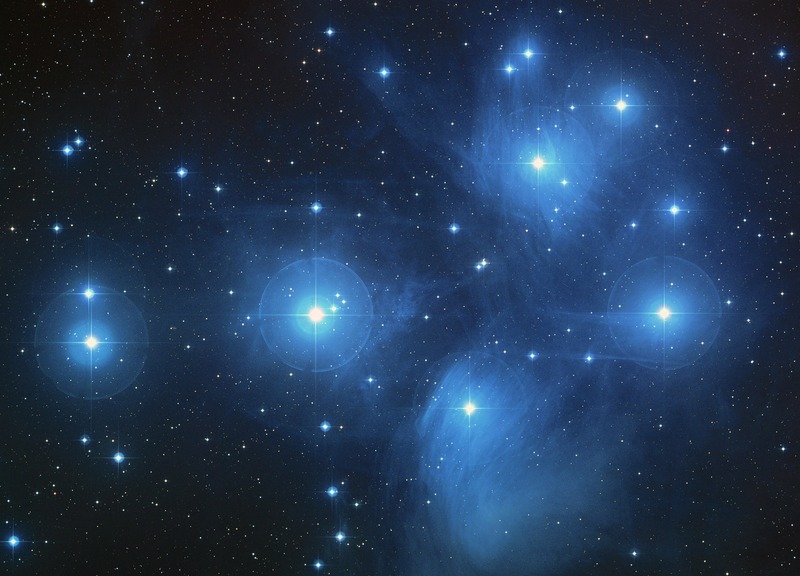 As a result, the team discovered that the seven bright stars of the Pleiades are variable stars. Most of the stars are slowly pulsating B-type stars. These massive, bright stars change brightness every one to five days. Such stars are poorly understood, so adding the stars in the Pleiades to the current list of known variables and studying the Kepler data will help astronomers better understand the processes that affect these stars. But one star, Maia, was different. Maia exhibits regular changes every 10 days; curious, the team followed up by observing the star with the Hertzsprung SONG Telescope. By looking at spectra, which identify the chemical components of the star, they determined that the brightness changes Kepler saw co-occur with changes in the element manganese in the star’s atmosphere. Rather than pulsating like the other stars do, Maia’s changes appear to be “caused by a large chemical spot on the surface of the star, which comes in and out of view as the star rotates with a ten day period,” said co-author Victoria Antoci, an Assistant Professor at the Stellar Astrophysics Centre, in a press release. Kepler’s forte is studying brightness changes in stars associated with the transit of orbiting planets. 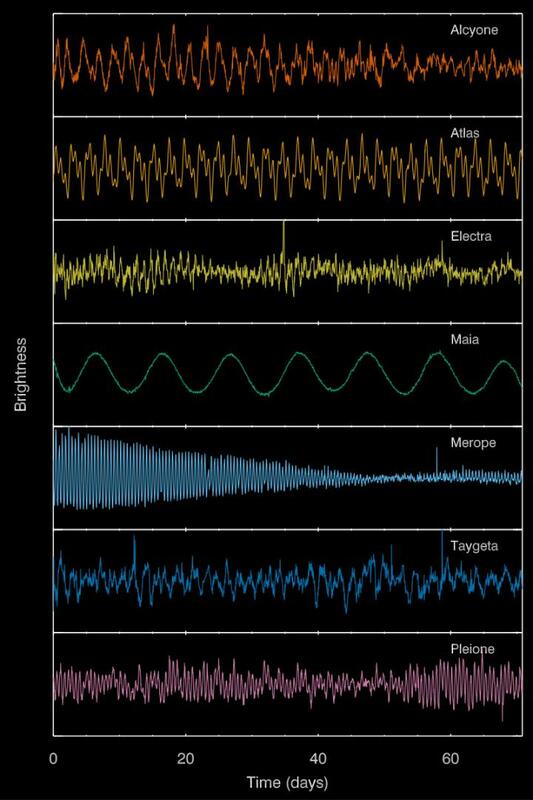 The satellite’s ability to accurately measure fluctuations in starlight also makes it an ideal tool to identify and study any cause of brightness changes from a star, such as pulsations or starspots. Kepler is now in its K2 mission, which has allowed the spacecraft to continue observing, even after the systems responsible for pointing the telescope failed. Kepler did not identify any transiting exoplanets during this study; however, the team says their new algorithm will allow Kepler and other planet-hunting telescopes to better search for planets around bright stars, which would have been otherwise skipped because they saturate the detector. They have also released the halo photometry algorithm as free open-source software for the community to use.